Personal: At the time of his passing, Joseph was in his second term as the Mayor of Kfarsghab. He attended Petty Prep. 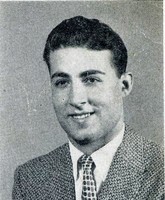 in Heightstown, NJ and graduated from Easton High School in 1956. Joseph returned to Lebanon and worked in the banking business. Survivers: Joseph is survived by his wife Victoria; sons, Awtel, toufic, Ghyassan; daughters, Zakia, Salem and Najwa; brothers, Francis and Tannous; sisters, Christine, Nazha,and Yasmin, and many grandchildren, neices, and nephews in Lebanon and Australia. He leaves many friends and family members in the Easton Area with loving memory. Services: A memorial Mass will be celebrated on Sunday at 10 a.m. in Our Lady of Lebanon Maronite catholic Church 4th and Ferry Sts., Easton.